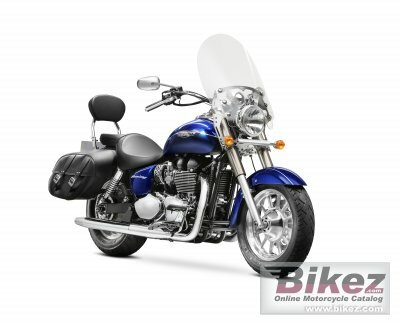 2015 Triumph America LT. Picture credits - Triumph. Submit more pictures. Striking machined fins pick out the distinctive parallel twin shape, while chrome engine covers are offset against jet-black barrels and crankcases. A pair of wide, dramatically splayed exhaust pipes dominate the LT�s front three-quarter profile with their classic �header-run� following a straight line from the throttle bodies through to the headers. Our parallel twin heritage for all to see and admire. Price as new (MSRP): US$ 9799. Prices depend on country, taxes, accessories, etc. Front suspension: Kayaba 41mm forks with polished stainless steel shrouds and polished lowers. Rear suspension: Kayaba chromed spring twin shocks with adjustable preload. Instruments: Analogue speedometer with odometer and trip information. Ask questions Join the 15 Triumph America LT discussion group or the general Triumph discussion group. Bikez.com has a discussion group for every motorcycle. Here you may find answers to common questions about the model. If you do not find what you are looking for, you can ask questions. Try out the 2015 Triumph America LT discussion forum. You can sign up for e-mail notifications when other users answer you. If you have information about any technical issue related to this motorcycle, please leave a comment for other riders.